aw.. so cute.. what is that u use as the Rabbit, is it egg white or kamakabo? it looks like he rabbit is holding a big heart to me.. so sweet.. Pretty rabbit...:) and always admire your hand-skill in using X-acto knife. I love the rabbit, it is so simple yet so cute and pretty! I still haven't tried to make anything with x-acto knife yet. I bought one in Daiso Singapore, but I am not sure if it's actually the knife that bento makers usually use. Well, we'll see :). Have to agree with Mama Elaine, your food arrangement is always so neat, great job :)! Hi Lia, How're you? Your bento making is always very cute and I love the little rabbit. So pretty! glad you're back! 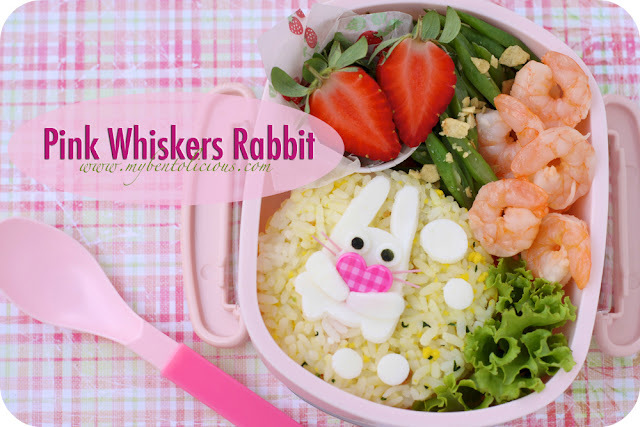 cute idea to use dry somen for the whiskers. Hi being waiting for a couple of weeks for ur sharing o..great that today you shared a few more with us..lovely bento w wooden spoon.o ya all ur mat r lovely may i know r they rubber mat ?where can get these lovely table mat?